Hergill is a terrific mix of Iceland’s best bloodlines. Hergill’s sire is the famous Logi frá Skarði. Logi was a top first prize four gaited stallion with a 9.5 for tolt and could be ridden by almost anyone due to his solid character. For the quality of his offspring (30+ first prize horses) Logi received the title of First Prize for Offspring. Had he stayed in Iceland he would have undoubtedly been awarded the Honor Prize for the quality of his offspring. Logi’s sire is none other than the Honor Prize stallion Hrafn frá Holtsmúla, who many believe is the greatest Icelandic breeding stallion of all time, a sire of many dream riding horses. On his dam’s side Logi comes from a long line of pure Kolkuós breeding - a line well known for their beauty and intelligence. Hergill’s dam, Hekla frá Oddhóli, is one of the top breeding mares at Sigurbjörn (“Diddi”) Bárðarson’s breeding farm. 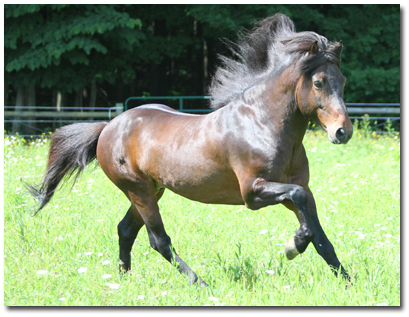 Hekla herself is an extremely talented five gaited mare, but her greatest accomplishments are as a breeding horse as all four of her evaluated offspring (including Hergill) are highly evaluated first prize horses. 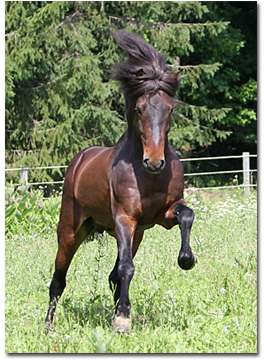 This is no surprise as Helka is the offspring of two very famous Honor Prize breeding horses: Ófeigur frá Flugumýri and Gola frá Brekkum (S: Hrafn frá Holtsmúla). Thus, Hergill has Hrafn on both sides of his pedigree and also combines in the Ófeigur and Kolkuós lines. This makes him truly an exciting combination of genetic strength through well-proven horses. Hergill is a very handsome horse, with solid conformation. He has a high set neck which gives him a regal appearance and provides him with excellent self-carriage. In addition, because his neck is also rather long it gives a good impression to the rider. It gives a secure feeling of a lot of horse in front of you. His back is nice and supple, and his proportions correct. His hooves are also well-formed and of excellent quality. 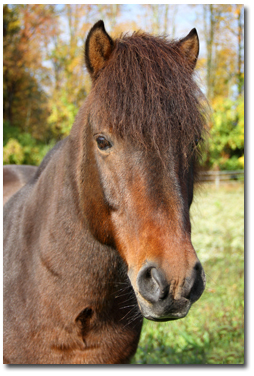 At age 15 a veterinarians examination showed him to have excellent joints with no signs of bone spavin. In fact, the vet remarked that Hergill looked to have the joints of a two year old! First and foremost, Hergill is an awesome riding horse. One person that has ridden him described him well as a Maserati! He is willing (he received a 9.0 for temperament), but very obedient and light on the reins. He is eager to please and has a terrific work ethic. On either the track or trail he is very level-headed and calm which makes him a really great pleasure horse. Hergill has four clear, strong gaits, including an incredible tolt, and with an experienced rider he can even show some flying pace. He has a lot of tolt and offers it readily to the rider. Though he has natural high action and a wide range of speed in tolt, his tolt is extremely smooth – like a magic carpet ride. His trot his big and ground covering, as are his walk and canter. Hergill has been very successful in Icelandic sport competition – first as a young horse in Iceland, and then later in California. 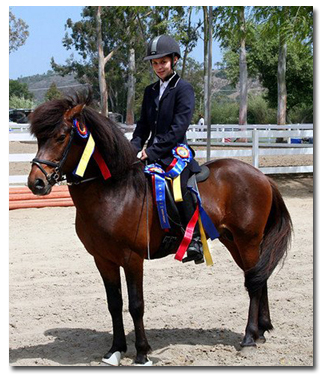 He has competed in both Tolt and Four-Gait classes bringing home many blue ribbons. Mostly he has been shown by children and teenage riders which is a testament to his excellent character. please visit his photo album. As of June of 2013 Hergill is now a gelding. We are very excited to have this incredible horse available as a riding horse full time.